The next sections of this report look in-depth at how some characteristics of adult immigrants are linked to their skill in using English. In general, immigrants are most likely to speak and read English very well if they have lived in the United States for many years, hold a college degree or arrived in this country at a young age. 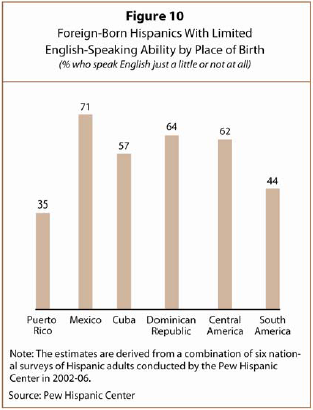 Puerto Ricans and South Americans report greater levels of ability in English than other origin groups, and Mexicans report the least. The longer an immigrant has been in the country, the more likely that person’s English skills are at a high level. Among Latino immigrants who have been U.S. residents the longest—for at least 26 years—43% report speaking English very well. Among the most recent arrivals—those who immigrated less than three years before taking the survey—just 14% report speaking English very well. 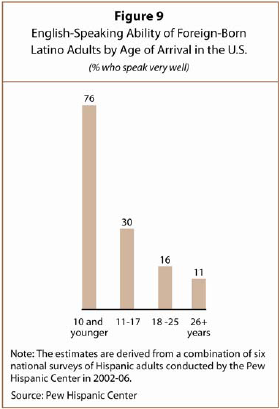 (Figure 5) Some 12% of those who have been here the longest say they speak no English, compared with 33% of the newest arrivals. Use of English at work or at home is more common among immigrants who have been in the United States longer. A quarter (24%) of those who have been in the country for 26 years or more speak only English at work, compared with 9% of those who arrived less than three years before taking the survey. Among the Hispanic immigrants here the longest, 10% speak only English at home, compared with 3% of the newest arrivals. 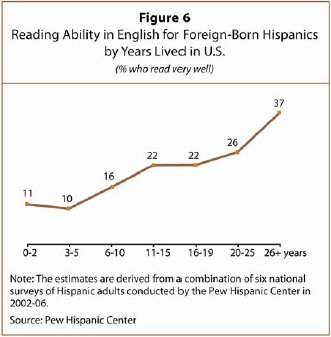 The education level of adult Hispanic immigrants is the key determinant of their ability to speak and read English. As a group, better educated immigrants begin their life in the United States knowing more English than do those with less education, and they maintain that advantage over time. They also are more likely to speak English both at home and at work, reinforcing their use of the language. Among newly arrived immigrants who graduated from high school but do not hold a college degree, just 14% say they speak English very well. Immigrants with this level of education who have lived in the United States longer are more likely to report they speak English very well. However, only among those who have been here 26 years or more does a majority (64%) speak English very well. Most members of this group who have lived in the United States 10 years or less answer “just a little” when asked how well they can carry on a conversation in English. Only 5% of newly arrived immigrants without a high school education report they speak English very well. 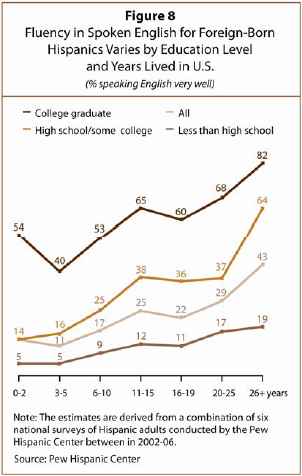 That share is higher among similarly educated immigrants who have lived in the United States longer. But even among those who have lived in this country at least 26 years, only 19% speak English very well. Latino immigrants without a high school education, from the newly arrived to those who have been here the longest, are most likely to say that they can carry on a conversation in English just a little. The pattern is the same for reading skill in English. Two-thirds (67%) of adult immigrants who arrived by age 10 report that they read English very well. So do 28% of Latino immigrants who arrived at ages 11-17; 14% of those who arrived at ages 18-25; and 9% of those who arrived at ages 26 or older. 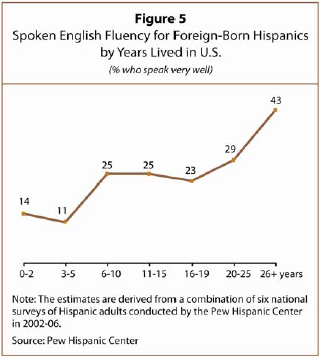 The likelihood that foreign-born Latinos speak very good English differs somewhat depending on where they were born. Most Puerto Ricans (52%) say they speak English very well, as do 39% of South Americans and 31% of Cubans. Fewer immigrants of Mexican origin than of any other major origin group say they speak English very well (16%). Education explains some, but not all, of these differences. Most college graduates from most countries speak English very well, as do most adult immigrants from Spanish-speaking countries who arrived in the U.S. at ages 10 and younger. The majority of Hispanic adults from most countries who did not complete high school, or who arrived at ages 18 and older, do not speak English very well. 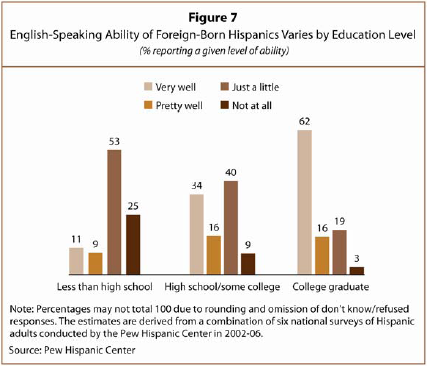 One reason for the low share of Mexican-born immigrants who speak English very well is that Mexicans are the least likely among the major country-of-origin groups to have graduated from college. Immigrants from South America and the Caribbean are more likely to have college degrees. Most Mexicans (56%), Cubans (60%), Dominicans (52%) and Central Americans (51%) say they speak only Spanish at home. By contrast, 32% of Puerto Ricans and 42% of South Americans speak only Spanish at home. On the job, Mexican and Cuban immigrants are the most likely among the major origin groups to speak only Spanish—a third do. Half of Mexicans speak only Spanish or mainly Spanish at work, the largest share of any major group. At the opposite end, most Puerto Ricans (51%) speak only English or mainly English, the sole major origin group to do so.